Campus traditions encourage students to let loose, blow off steam, and temporarily engage in silly behavior. 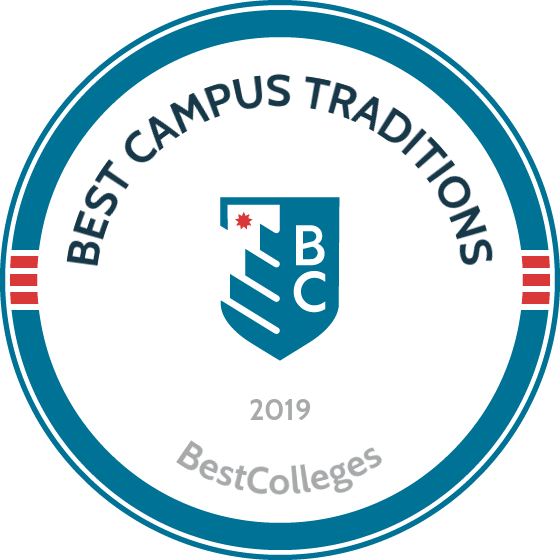 Nearly every college and university maintains traditions -- from annual parties and fight songs to campus-wide events -- that bind the campus community and give students a sense of school pride. The best college traditions survive because of their uniqueness, pageantry, and/or entertainment value. For example, traditions on this list include tossing pianos off buildings, participating in thousand-person snowball wars, and throwing water balloons at the school president. Campus traditions also endure because they are shrouded in mystery. In fact, some rituals have been going on so long that nobody quite knows how or why they started. The greatest college traditions are alive; they formed organically over time, and will continue to adapt and change for years to come. Hope College hosts the Pull, an annual tug-of-war contest across the Black River between freshmen and sophomores. Each team nominates 18 "pullers," as well as 18 "moralers" who coach the pullers. The competition encourages a healthy rivalry between the odd and even class years, with the juniors coaching the freshmen and seniors coaching sophomores. Originally, the competition could go on indefinitely, but the school recently imposed a three-hour time limit. The first Pull apparently occurred in 1898, making it one of the longest running college traditions in the country. Hope also hosts the annual Nykerk Cup Competition, an event that pits freshmen and sophomore women against each other in song, dance, and oration. Similar to the Pull, juniors and seniors do not participate but act as morale boosters. This tradition began in 1935. Dragon Day has occurred at Cornell University almost every year since 1901. Each year, on the Friday before spring break, first-year architecture students parade through campus a large, home-built dragon. For many years, students would burn the dragon in a bonfire, but they abandoned part of the tradition in 2009 due to new environmental regulations. Instead, students end the event in a new way each year. Over the years, Dragon Day developed a rivalry between the architecture and engineering students. The engineering students now build a phoenix to challenge the dragon, and each side regularly plays pranks on the other. Students have also used Dragon Day to express political views. For instance, in 1934, students built a large beer stein instead of a dragon to celebrate the end of Prohibition, and in 1968, they painted the dragon black to protest the Vietnam War. Located in snowy New Hampshire, Dartmouth College celebrates the coming of winter each year with a Winter Carnival. The event began in 1911 as a weekend dedicated to winter sports and has become a full-fledged festival that spans three days. The carnival incorporates many events across campus, including ski competitions, concerts, and a human dog sled race, during which teams of students pull each other around the snowy campus. Students can also participate in the annual Polar Bear Swim by plunging into a freezing campus pond. In addition, the school sponsors an ice sculpting contest, in which 25 teams compete and then present their creations on the quad. Each year, students build a massive snow sculpture on the quad reflecting that year's theme. In addition, the festival has earned a place in popular culture, and a movie depicting the event, "Winter Carnival," was released in 1939. Virginia Polytechnic Institute and State University (Virginia Tech) functions as one of six senior military colleges in the U.S. and maintains an Reserve Officers' Training Corps program called Corps of Cadets. For over 100 years, the campus has hosted an annual snowball fight that pits cadets against civilian students. In 2018, more than 1,000 students participated in the battle, which celebrates the first snowfall of the year. The fight sometimes involves snow forts and oversized slingshots. Another unique tradition to look out for at Virginia Tech is the Homecoming Game Ball Run. Each year since 1977, a group of ROTC cadets spends the week before the homecoming game running the game ball 100 miles around campus. Lawrence University hosts the longest running trivia competition in the world. The Wisconsin-based college has hosted the annual Great Midwest Trivia Contest since 1966. A test of physical and mental endurance, the competition runs for 50 consecutive hours each January, starting at precisely 10:00:37 p.m. Friday and ending at midnight on Sunday. Each year, the competition begins with the last question from the previous year, making it, technically, the world's longest running trivia contest. The contest traditionally stresses fun over competition, and the event's governing motto is "Trivia is meant to be entertainment and should be perceived solely in that light." Each year, participants compete for quirky prizes such as pink plastic flamingos. Another notable tradition at Lawrence is the annual Beach Bash, in which students party in a house filled with beach sand and a lifeguard station. New students attending their first University of Pennsylvania football game might notice a strange occurrence after the third quarter. At a specific point in a school song, Penn fans begin hurling pieces of toast onto the field. According to campus lore, the toast-throwing spectacle began in the 1970s after the school banned alcohol in the stadium. Since then, after singing the line "Here's a toast to dear old Penn" in a school fight song, students have been throwing toast instead of taking a drink. As is true of many great campus traditions, the toast-throwing has transformed over the years, and now students chuck all different types of baked goods including bagels, muffins, and pumpernickel. According to the school, during a well-attended game fans throw between 20,000 and 30,000 pieces of toast. Those who stay until after the game can watch the "toast zamboni" clean up the mess. Though Carleton College excels in ultimate frisbee, one of its best traditions involves another sport. Known as Rotblatt, this event takes the form of an exceptionally long softball game each spring. Rotblatt began in 1967, when one of the campus softball leagues hosted a game celebrating Carleton's centennial, playing one inning for each year the school existed. Since then, students have continued the tradition, adding an inning each year. Around 20 students participated in the first Rotblatt, and now the event attracts around 1,500 students annually. It has also expanded beyond just a softball game to a huge, school-wide celebration where students play frisbee and other games, and lounge in the grass with friends. Rotblatt does not have many rules, but traditionally students play one inning with a drink in their hand. At California Institute of Technology (Caltech), students participate in a tradition called Ditch Day, which began around 1920 when seniors were granted a day off. Their off-campus absence allowed underclassmen to break into seniors' rooms and play pranks. After that, seniors blockaded their rooms with furniture, wood boards, and cinder blocks. Today, the senior class leaves behind elaborate puzzles, scavenger hunts, and brain teasers to keep the underclassmen occupied. Some seniors allegedly spend months devising challenges for the younger counterparts. The seniors keep Ditch Day a secret until the last minute, so underclassmen don't know when it will take place. Each year, Indiana University (IU) hosts a bike race called the Little 500. Howdy Wilcox Jr., the executive director of the Indiana University Student Foundation, founded the race in 1951. He based it on the Indianapolis 500 automotive race, which his father won in 1911. At the Little 500, student riders compete in teams of four and complete 200 laps. The event, which organizers dub "The World's Greatest College Weekend," attracts more than 25,000 fans each year. Since its beginnings nearly 70 years ago, the event has expanded to include a week of festivities including a women's race and an alumni race. Proceeds from the Little 500 go toward a scholarship fund for IU students, and the event has raised more than $1 million since its founding. During his 2008 presidential campaign, then-candidate Barack Obama made a surprise appearance at the Little 500. Swarthmore College's science fiction club, Psi Phi, annually hosts the Pterodactyl Hunt. The event, which began in 1982, consists of a battle in which students dress up as monsters or hunters. Hunters wear white trash bags, while monsters wear black ones. Students run around campus, engaging in play battles with foam swords and squirt guns. Over time, the hunt has grown increasingly complicated, incorporating hunting licenses, quests, and a points system. For every monster they kill, hunters receive points, which they can redeem for shields, weapons, and quest cards. The battle does not end until all pterodactyls are killed. The Pterodactyl Hunt celebrates the weirdness and eccentricness of Swarthmore's student body. During the hunt, students are encouraged to dress in elaborate costumes and to act as ridiculously as they please. Reed College, a liberal arts school known for its unconventional student body, hosts a unique spring festival called Renn Fayre. The event began in the late 1960s as a one-day renaissance fair where students and faculty dressed up in period costumes, watched sword fights, and traded medieval wares. Over time, Renn Fayre grew to three days and now features a fire show, a fireworks display, a giant slide, and skate ramp. The fair takes place to celebrate the end of the school year and the completion of theses. At the beginning of the event, seniors submit their theses to the president and then burn their notes in a bonfire. On Canyon Day, Reed's oldest campus tradition, students care for the watershed that runs through campus by pulling weeds and planting new flora. Many of University of New Hampshire's (UNH) best customs revolve around its love of sports. A truly one-of-a-kind college tradition, students toss a fish onto the rink at every hockey game. After UNH scores its first goal each game, all the fans know to look towards the visiting team's net, where UNH students hurl a fish over the wall and onto the ice. The tradition began in the 1970s, and the Zeta Chi fraternity has since taken on the responsibility of throwing the fish at every game. The tradition bears so much importance to the school that UNH hockey coaches continue the custom despite penalties from the referees. At sports games, UNH students also enjoy chanting the school's fight songs and cheers. The University of Chicago boasts many campus traditions including an annual scavenger hunt that spans four days in late May, wherein students must track down over 300 items. The scavenger hunt incorporates riddles, competitions, a three-course meal, and a 2,000-mile road trip. From 2011 to 2014, the University of Chicago's scavenger hunt held the Guinness World Record for the largest scavenger hunt. Each year, the Scavenger Hunt committee appoints student judges to compile the list of tasks and evaluate participants' performances. In addition, the list typically includes many strange or impossible tasks. Some items required by past scavenger hunts include a live elephant, a Stradivarius violin, and a periodic coffee table. A notable campus tradition at MIT is the Piano Drop. Originating in 1972, the Piano Drop involves a group of students hurling a piano from the roof of one of the dorms on-campus. Hundreds of students gather to watch the spectacle, rushing to pick up broken pieces to take home as keepsakes. In recent years, students have turned the Piano Drop into a charity event, selling shirts and donating the proceeds. In addition, MIT's Department of Earth, Atmospheric, and Planetary Sciences hosts an annual Pumpkin Drop every Halloween. During the event, students gather to watch pumpkins fall from a 295-foot building on-campus. Each year, SUNY Buffalo hosts one of the largest mud volleyball tournaments in the country. The competition, known as Oozefest, attracts more than 1,500 people each year. The tradition began in 1984 as a way for students to loosen up before finals, but it now welcomes faculty, alumni, corporate sponsors, friends, and students from other schools. Before the tournament begins, the university brings in firetrucks to hose down dirt fields and create a large mud pit on the university's north campus. The organizers award trophies to the winners and also to the best-dressed players. During orientation weekend, students take part in another SUNY Buffalo traditions. Thousands of students don either a gray or blue shirt, and arrange themselves to create an enormous UB logo on-campus. The tradition brings new students into the campus community, and promotes school pride. For over 40 years, students at Tufts University have participated in the creative tradition of painting the school's cannon. In 1956, the City of Medford Historical Society gifted the university a replica of a cannon from the U.S.S. Constitution. Around 20 years later, as a form of protest against the university, students painted the cannon black. Then, students who disagreed with the protest repainted the cannon. Since then, various students and groups have painted and repainted the cannon in demonstration and for fun. The eight-foot cannon is now covered in so many layers of paint that the university has to move it with machinery. Students have adopted a few guidelines for painting the cannon. They may only paint it after sunset, and afterwards, they camp out until sunrise so that nobody paints over their creation. Each year, Purdue University honors Indiana's racing history through the Purdue Grand Prix. For the event, which began in 1958, student groups, Greek organizations, and residence halls build and race go-karts around a dedicated course on Purdue's West Lafayette campus. Students from all Purdue campus locations participate, and the school hosts alumni races every five years. The tradition has taken on more features over the last 60 years. In 2009, the university unveiled a new track, which cost $1 million and features one of the most advanced electronic scoring systems of any go-karting facility. In 2010, Purdue held the first Electric Vehicle Grand Prix after the traditional race. Today, students participate in race-related festivities the week before the event. The race raises around $10,000 each year for the Purdue Grand Prix Foundation, which awards scholarships to Purdue students. Based in New Orleans, Tulane University embraces local culture through its annual Crawfest. The springtime festival -- which celebrates local food, music, and art -- is free for all Tulane students, faculty, and staff. The event also marks the beginning of crawfish season and features more than 20,000 pounds of crawfish each year. Attendees get access to unlimited food and drink, and festival-goers can enjoy 25 local food and art vendors, as well as performances from 12 musical acts. The event draws more than 10,000 people each year. Tulane also incorporates Louisiana culture into campus life by serving red beans and rice every Monday, and gumbo and fried catfish on Fridays. Many of Tulane's other campus traditions center around its sporting events, and the college's favorite cheer is called the Hullabaloo. In addition, after their convocation ceremony, new freshmen touch the school's Victory Bell for good luck. Pomona College, the founding member of the five Claremont Colleges, was established in 1887 by Congregationalists looking to create a New England-style liberal arts school on the West Coast. The school, which sits on a 140-acre campus near both the Pacific Ocean and the San Gabriel Mountains, takes advantage of its location by hosting the annual Ski-Beach Day in the spring semester. Students spend the first half the day snow skiing at a nearby resort, and the latter part of the day enjoying a Los Angeles or Orange County beach. Another campus tradition is Nochella, an alternative music festival that takes place every spring. The festival traditionally celebrates artists and genres that have not broken into the mainstream. The event is free, and the organizers provide food. Musical genres included often range from electronic dance to alternative hip-hop, and the concert takes place in various locations each year. Though Johns Hopkins University stresses academic rigor and research, its students definitely know how to enjoy themselves outside of the classroom. Each spring, more than 100 pink plastic flamingos mysteriously appear on the school's Keyser Quad. They remain there throughout the day, and then disappear by the following morning. The tradition started in 2004 with the formation of the Whimsy Progress Administration, a play on the Roosevelt-era Works Progress Administration. Students formed the organization to bring some silliness to the otherwise studious and serious student body. In addition, students celebrate the beginning of the fall semester with HOPtoberfest, a festival that includes a haunted house, laser tag, outdoor movie screenings, and live musical performances from big-name acts. North Carolina State University's Krispy Kreme Challenge blends doughnuts, exercise, and charity to create an exciting campus tradition. The challenge began as a simple dare between students and then turned into a large fundraising event. To complete the challenge, participants must run 2.5 miles to a Krispy Kreme Doughnuts store, eat a dozen donuts, and run back to campus in under an hour. The first Krispy Kreme Challenge took place in 2004 and, as of 2014, runners had raised around $1 million through the event. All the profits go to the North Carolina Children's Hospital, and around 10,000 runners take part in the event each year. This campus tradition has inspired other doughnut-themed races at colleges across the country. Students at the University of Kansas, Florida State University, the University of Kentucky, and the University of North Carolina have all established similar races at their schools. The annual Penn State IFC/Panhellenic Dance Marathon (THON) takes place every February and raises money for children battling cancer. The University's Interfraternity Council started the event in 1973, raising more than $2,000. The event has grown steadily from its humble beginnings, and today more than 15,000 students participate each year by dancing for 46 hours straight. In 2018, THON raised more than $10 million for the Four Diamonds Fund, a charity dedicated to defeating pediatric cancer through research and through the Penn State Hershey Children's Hospital. The university also hosts other THON-related events, including the a 5K run and family carnival. THON has raised a total of around $157 million over the years and claims to be the largest student-run philanthropic organization in the world. Perhaps it is due to the Los Angeles heat, but Occidental College's best traditions all involve getting soaked. Occidental freshmen may want to keep their birthdays a secret if they don't want to get wet. Campus tradition dictates that students get dunked in the Lucille Gilman Memorial Fountain on their birthday. In addition, the commencement ceremony rehearsal at Occidental features an unusual twist. At the end of the rehearsal, the seniors battle the president's office staff in an epic water balloon fight called Last Licks. The school features other long running traditions, such as Founders Day. Each year on April 20, students celebrate the school's birthday by playing carnival games, riding a ferris wheel, and hanging out on-campus. Festivities also include dinners and theater performances. On this day, Occidental also celebrates its intellectual achievements through panel discussions and presentations by prominent alumni. Every spring, Le Moyne College surprises students with Dolphy Day, an event that allows students to skip classes and relax before their final exams. Dolphy Day typically takes place on the first beautiful spring day, but students do not find out exact date until the last minute. Dolphy Day starts at around 2:00 a.m., with a fireworks display. Students then gather in the quad to enjoy the sunshine and play lawn games like dizzy bat, volleyball, football, and frisbee. The university also provides a DJ for the event, and students dance on the lawn. Dolphy Day culminates in a school-sponsored barbeque that staff, administrators, and students attend. Since the tradition's inception in 1972, the Dolphy Day Wizard has served as an integral part of the festivities. The Wizard, always a senior, works with the administration to plan Dolphy Day, and then he or she nominates the next Wizard. The University of Central Florida's Spirit Splash occurs the Friday before the homecoming football game. A pool party/pep rally, the event is the only time the school allows students in the reflecting pond. After students rush into the pond, they enjoy performances from the cheerleading squad and marching band. As at most pep rallies, students chant fight songs, dance, and cheer. One of the more odd components of the event happens when cheerleaders and event organizers toss rubber ducks into the crowd and students clamor to catch them. As is true of many great campus customs, the Spirit Splash began spontaneously. According to campus lore, someone pushed the student body president into the pond at a pep rally in 1995, and the rest of the students followed suit. Shortly thereafter, the university adopted the name Spirit Splash and made the event official. Ranking the best college traditions is largely subjective, but this list -- a sampling of traditions in which U.S. college students partake -- depends on a few hard figures. We ranked the college traditions below based on their uniqueness and their longevity. Each school received a score for both categories, and then was awarded a total score out of 100.